This Inklingo PDF includes the shapes to print on fabric. There are also back-basting layouts which give perfect positioning with scraps—without printing the shapes or using templates! skip the tracing, skip the light box, skip the markers! 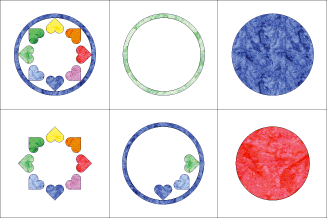 This additional free Inklingo PDF teaches how to use the print dialog box to print Circle of Hearts in the sizes you want. 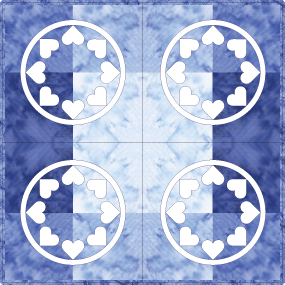 GALLERY OF QUILTS Click on the quilt to see more designs. You will be happy with the results you get with sewing lines printed on the fabric! Please tell your favorite designers and their publishers and magazine editors that you want their designs to be inklingoable!